Dale Heckenberg from Acme Services. Dale Heckenberg is the managing director for Acme Services Pty Ltd in western Sydney, NSW. Starting at a young age, Dale's been in the industry for 14 years and hopes to continue growing his business in the coming years. Get to know more about Dale and his company here. We do grounds and vegetation management. We currently hold vegetation clearing contracts for Transgrid and Endeavour Energy. Our contract with Transgrid requires us to manage all the vegetation along their power-line easements and access tracks. Our contract with Endeavour Energy involves the clearing of vegetation and also minor and major civil works along their access tracks. 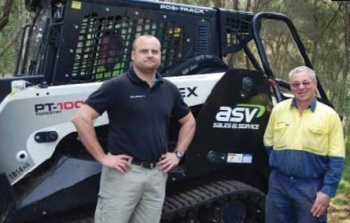 Our staff consists of experienced tree climbers, EWP operators and machine operators. This allows us to cover all the vegetation/civil management requirements of our clients. I started helping my father with bushfire hazard reduction work on weekends when I was 10. He was working as a contractor for the Blue Mountains City Council, clearing vegetation from overgrown blocks of land in the Blue Mountains. He had an old 70hp international tractor with a slasher on the back of it. My job was to go around with an axe and clear the vegetation from around the larger trees and stack them in a pile ready to be mulched by the slasher on the tractor. 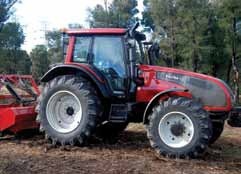 My father soon upgraded his tractor and purchased an Antonio Carraro tractor that was perfectly suited to the type of work he was performing. I continued helping on weekends throughout my time at school and also when I started work as a refrigeration mechanic apprentice. After eight years as a refrigeration mechanic I started working for my father full-time with the intention of taking over his business. To date I have been working in the industry for 10 years full-time and 14 years part-time. Describe the area where you do most of your work. The area our contracted work is performed stretches from Nowra in the south, up to Brooklyn in the north and out to Bylong in the west. We cover a large area and our staff are sometimes required to live away when working in some areas. What machine do you use that works best in the area you're working in? We are currently running two Terex/ASV Posi- Track machines that work the best and are used the most for the type of work we are performing. They are extremely versatile because we can change the implement on the machine to suit the job. We purchased our first Posi-Track back in 2008 and had it fitted with a Fecon mulcher. 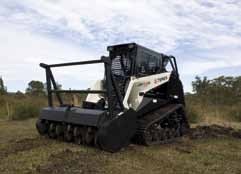 We used it exclusively for vegetation clearing work on our TransGrid contract and found it to be a reliable and productive machine. At the same time we purchased a Valtra N191 tractor fitted with a AHWI mulcher to perform vegetation clearing works in more heavily vegetated areas and where we were clearing hectares of vegetation at a time. Of the two machines, we have used the Posi-Track constantly since its purchase, as opposed to the Valtra that is a lot bigger and only suited to certain applications. Our Endeavour Energy contract required us to clear the vegetation, perform civil works and use a roller to roll on the access tracks once the civil works were complete. We found that with the correct attachments, our Posi-Track could perform all of these tasks. What is the hardest thing about your working environment? Our work is performed in some fairly remote areas and reliability is a huge requirement for us in our machinery. Our Posi-Tracks have been the most reliable of all our machines. When we have had breakdowns, they were not mechanical issues. 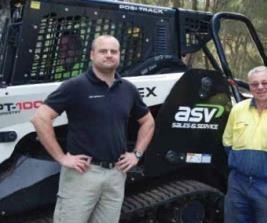 We take them straight to ASV Sales & Service at Wyong and they ensure that our machine is repaired as soon as possible so we can get back to work. On wet days when we are not working, we get our machines serviced. What made you choose the machine you are using? And why is this machine unique? I had actually heard about the machines through the industry and decided that I would go and have a look at one. Prior to purchasing the Posi- Track we had only ever run our mulchers on tractors. The minute I looked at the machine I noticed so many advantages over the tractors. Flat tyres can be a huge problem when using tractors but with the Posi-Track you no longer have to worry about staking a tyre. With tractor mounted mulchers, you are restricted with the height you can lift the mulcher when trying to mulch vegetation. With the Posi-Track you can easily reach up to the top of clumps of vegetation like lantana and blackberry, and mulch from the top down. With the tractors you end up driving through the vegetation and creating a tunnel. You then have to get out of the machine and cut some of the vegetation by hand to get the rest of the vegetation to fall to the ground so that it can be mulched. The third biggest advantage I found was the easy access to the engine to perform daily checks and maintenance. How many machines do you have and what are your top two favourites? We currently have eight machines in our fleet. We have two Posi-Tracks fitted with mulchers and other attachments and six tractors ranging from 200hp down to 90hp. The tractors are fitted with either mulchers, slashers or a reach mower depending on the job requirements. We have a circular saw attachment for our reach mower that is used to trim the sides of the access tracks and cuts down on a lot of the hard work. Have you always wanted to be a contractor? If not, what did you want to be? I have always had an interest in machines. When I was four, I went to work for the day with my best friend and his dad who worked at the local council. Apparently when I got home I told my parents that when I grow up I wanted to drive a water truck on the council. I enjoyed my work as a refrigeration mechanic, but towards the end I was starting to find the job not as rewarding as it had first been and I was looking for something else to do. Dad's suggestion about starting work with him sounded like a good idea and I haven't looked back since. I spend most of my time in the office now and don't drive the machines that often anymore, so over the last five years or so the thing I get most satisfaction out of is seeing my business run smoothly. By smoothly I mean my clients are happy, my staff are happy and we are still improving and growing as a company. The worst part is the wet weather. The odd wet day can be quite good as it allows a few odd jobs to be performed around the depot. But it's bad having a complete week or more of wet weather when we cannot go and perform work. Is your industry competitive? How do you stand out? I think all industries are competitive. I think our competitive edge comes from having the right equipment for the jobs that need to be performed, and more importantly having quality staff. We currently have more than 20 staff working for us with the majority having been employed at Acme Services for five to 10 years. How does your machine perform in such extreme conditions? The big advantage we found with our Posi-Track was that the mulcher is run hydraulically. This means all the rough work the mulcher performs is limited to the mulcher. With the PTO driven mulchers like those on our tractors, the mulcher is connected to the PTO shaft that is directly connected to the engine in the tractor. This places far greater stresses and demands on the engines of the tractors than the engines in our Posi-Tracks. How often do you need to do maintenance work on your machines? Every day the machines are greased, oil and coolant levels are checked and air filters are cleaned. The more major servicing is done at 250-hour intervals. What are your goals professionally in the next five to 20 years? My goal is to continue to grow as a company. I don't see the type of work we perform changing. What is your advice to those who are thinking of going into this industry? I would suggest that they seek employment with a smaller company where they are not required to have many formal qualifications to work onsite. They will gain a lot of experience, and over time will gain formal qualifications. Companies that are working on large government contracts require their staff to have a long list of qualifications before they are allowed to work on any of these government contracts. Completing a TAFE course that relates to the type of work they are performing is also a huge advantage for them. With your experience in the field now, what do you think you should have done better early on in your career? Not much, we grew as a business at a steady pace and only purchased equipment we had work for. The steady growth allowed us to recruit and train quality staff so we always had people working onsite that were familiar with the way Acme Services did things. If you were not a contractor, what other profession would you want to do and why? I'd have to say a barrister as I've had a few dealings with the legal system over the years and I'm good friends with several people in the legal fraternity. I have always found their work interesting. I have been told recently by a member of the Queen's Council that I have a great aptitude for legal work and a good legal mind. This comment along with past legal cases I have been involved in has made me think about what it would be like to work as a barrister. I think I would really enjoy it. How do you take a break or relax after a gruelling day at work? I enjoy running. I have competed in a couple of half marathon races and I've entered in a full marathon for September.